Your baby will communicate with you from the day she is born. During her first year, your baby will learn to use babbling and cooing sounds that will turn into the beginnings of speech. She will also use facial expressions and cries to communicate her different needs to you. It is very important to speak to your child every day. Though she will not respond with words, she is learning how important words are and she will eventually begin to use words to communicate her needs. 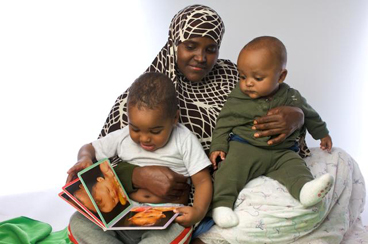 A great way to share language with your baby is to read board books to him. You can also sing, share rhymes, and talk about the things you see and do during a regular day. You might talk about the tall trees and birds you can hear when out for a walk or say the names of the vegetables you are buying at the grocery store. These are all great ways to share words with your child. He might not understand them right away but every time you read or talk to him, he'll understand a little bit more and before you know it, he will begin to understand simple words or phrases! Hugging, kissing, and cuddling your baby every day is also very important. With physical touch you are expressing your love for him while teaching him the importance of showing affection. During this first year your child may become attached to a favourite toy or blanket and he may want to bring this favourite object with him everywhere. This is normal and may be one of the ways he is able to soothe himself when he is uncomfortable or upset. Babies express fear by crying, frowning or clinging to a parent. Learn ways to soothe early fears.